Jean is preparing a birthday dinner for her mild-mannered accountant husband Henry. Good friends Betty and Vic are expected any minute, and Jean is frantic because Henry is late. When he eventually arrives, Jean finds him not quite the man he used to be. He wants to emigrate to Barcelona immediately, and with good reason: the briefcase he accidentally picked up on the Underground is stuffed with bundles of fifty pound notes amounting to £735,000! But if getting the money was easy, keeping it proves harder, as not one but two police inspectors call and Henry, Vic, Betty and a bemused (and tipsy) Jean are forced into a frantic game of cat and mouse. 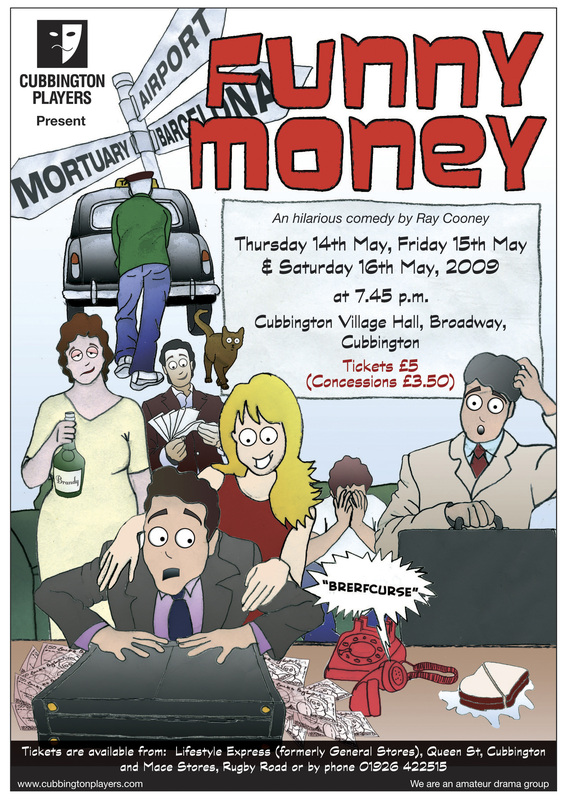 Hilarity ensued last week with the Cubbington Players’ performance of Ray Cooney’s Funny Money. In it, mild mannered accountant Henry Perkins (Dan Hawkins) accidentally discovers £735,000 and attempts to escape with the cash to Barcelona, despite his wife’s pleas to the contrary. Cooney’s play is an excellent choice and is very witty, except for one or two cheap and obvious jokes. It was excuted with energy and pace. Mark Frampton, playing Henry’s friend Vic, acted and reacted brilliantly and had the audience in fits of laughter with his perfect comic timing. Frampton’s contribution, though, was just one element in the entertaining performance of a well-cast ensemble.